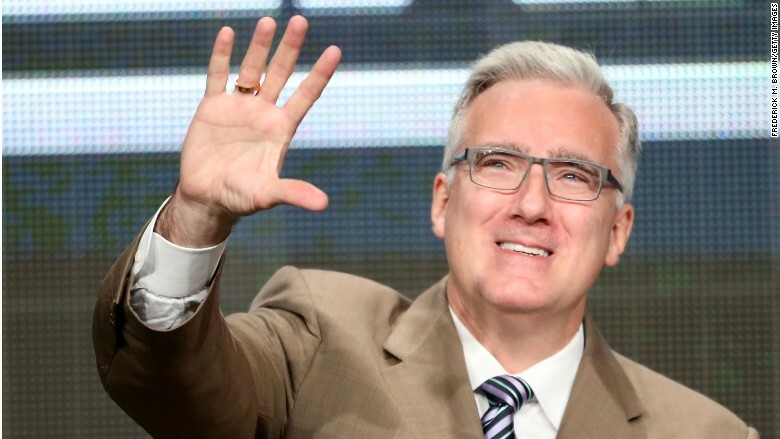 ESPN has suspended anchor Keith Olbermann for the remainder of the week. ESPN has suspended anchor Keith Olbermann for the remainder of the week over a Twitter spat that the anchor had with fans of Penn State University. Early Monday, a Penn State supporter tweeted at Olbermann with the university's trademark slogan: "We Are!" Olbermann, who has been critical of Penn State in the past, responded by finishing the phrase with "...Pitiful." The original tweet, however, also included a link to a Penn State student newspaper story about the school raising $13 million in support of children and their families fighting pediatric cancer at the Penn State Milton S. Hershey Medical Center. Penn State supporters chimed in and went after Olbermann: "So you have no opinion on Penn State raising over $13 million for pediatric cancer research?" one tweet read. Olbermann didn't back down. "Good for you," he responded. "Doesn't change the school's reputation. Check back next century." A wave of outrage followed on Twitter (TWTR). "@KeithOlbermann What makes us pitiful? The fact that we are smart college students raising money for a great cause? You are pitiful, sir," another person tweeted. On Tuesday, ESPN suspended Olbermann. "We are aware of the exchange Keith Olbermann had on Twitter last night regarding Penn State. It was completely inappropriate and does not reflect the views of ESPN," the network wrote in a statement on Tuesday. "ESPN and Keith have agreed that he will not host his show for the remainder of this week and will return on Monday." Olbermann also apologized in the end. "I apologize for the PSU tweets," Olbermann tweeted. "I was stupid and childish and way less mature than the students there who did such a great fundraising job." Olbermann returned to the sports channel in 2013 to host the daily "Olbermann" show on sister network ESPN 2.